We all know how good it is for children to take up musical instruments, and but not all kids have the patience to learn how to play the piano or violin. 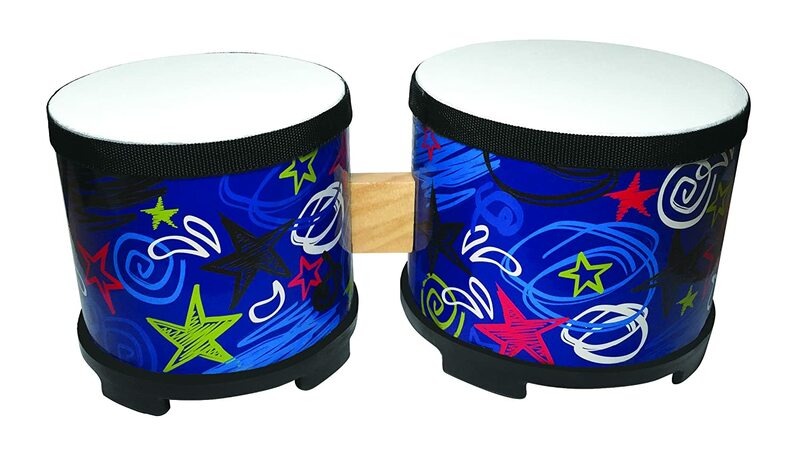 So for super active kids with a lot of energy, a set of bongos will be a great way to get them into music. Bongos and congas make mini drums for kids, and if your child decides to take up drumming, they not only have a great hobby that bring them joy and fun for life, drums also have a positive effect on their psychological development. In this review, you will find drums for babies, toddlers, kids and even adults. Therefore, we are happy to share with you our review for the best bongo drums for kids in order to make sure that you can get the best set of drums for your child. 20.0.6 Where to buy bongo drums? 20.0.7 How old to start playing the bongos? 20.0.8 What are bongos made out of? 20.0.9 How are bongo drums made? 20.0.10 How to tune bongos? 20.0.11 Are there different types of bongos? Motor Skills – Having your child get a set of children’s drums and learning to play them will be a great development for their motor skills, hand eye coordination, and developing a sense of rhythm. Being able to coordinate their hands together and make different sounds by hitting the drum at different points and with different speed and strength is actually quite a complex processes, so playing the drums is a good workout for their brain as well as their arms and hands. Stress relief – Playing a set of children’s bongo drums will be a great way for your little one to vent some frustration, so if they’ve had a hard day at school they can take it out on the drums. Long term, this is going to teach them to channel their negative feelings, like disappointment or anger, into something positive. Playing a musical instrument is also a great way to cheer yourself up. Develop confidence The drums are loud and proud, and as your child practices and gets good at playing them, they will become confident in their abilities to perform in front of others and show their talents. A set of mini bongos for a shy child might be a good way to encourage them to come out of their shell a little bit. Staying active Playing the bongos is a very energetic activity, and your children will certainly burn off a lot of energy doing this. Its a much more physical instrument than guitar or piano, and they will be getting some good physical exercise while they play. A way to make friends By getting good at the bongos, your child will be developing a lifelong skill that will help them make friends throughout their lives. They will be able to jam with other musicians and play in bands, which is not only a cool way to meet people but playing with others is a great way to learn about interaction, communication, and teamwork. Teaches them about the world You might not think that drums can help with geography class in school, but bear with me for a minute. By getting your child a set of hand drums, you are opening them up to a huge range of world music, from reggae to Latin bossa nova and African tribal music. Your child will want to know about the places that all these wonderful sounds come from, and as such, will open their horizons to all kinds of places and cultures. Whether or not your baby will grow up to be an amazing drummer, a toy bongo drum is going to be something that brings them a lot of joy and also help with their development. 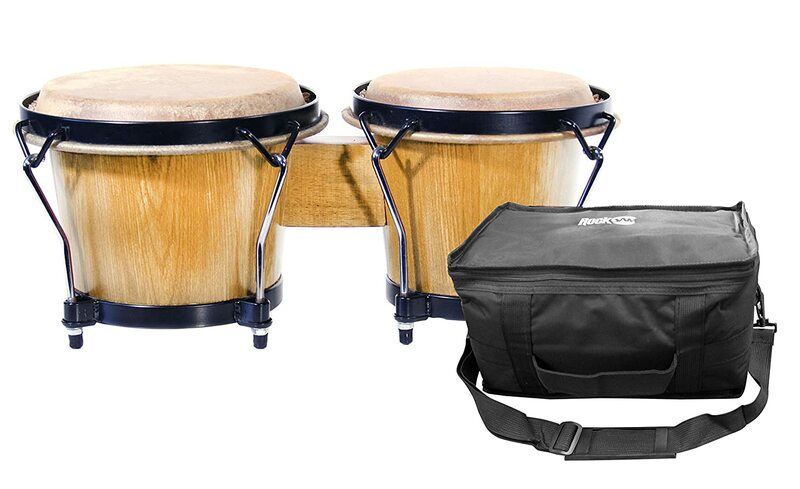 Here are some great mini bongos to choose from. 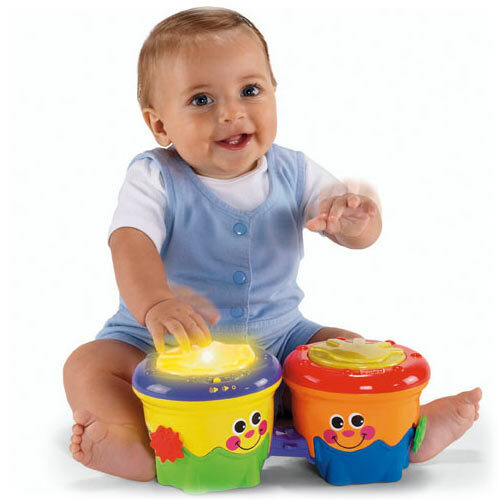 If you are looking for a great and colorful way to get your baby playing with drums, then this electric bongo set is really going to capture their imagination. 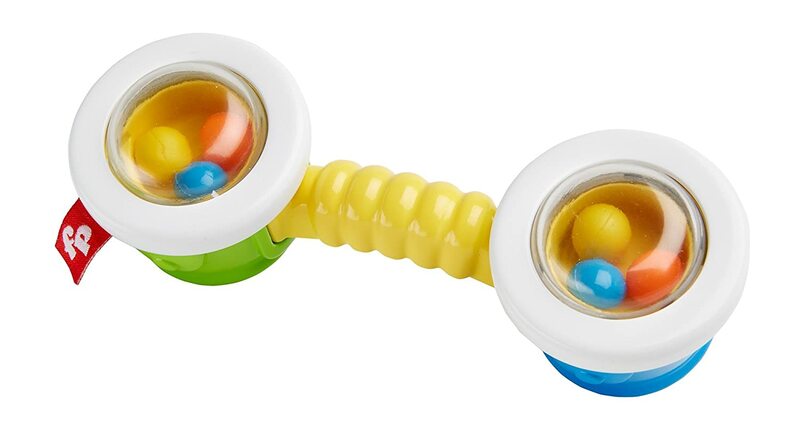 It has three different drum pads, which light up and play a different sound when touched, so your baby will really be interested in it and love giving it a good whack. 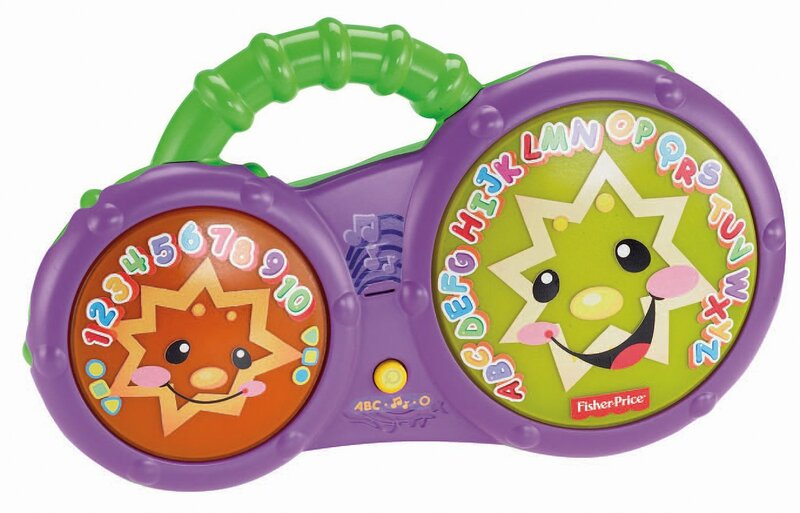 It also has a really cool mode where it plays up to 5 different melodies for your child to play along too. Batteries are also included! This cool mini bong set doesn’t have any electronics or flashing lights, but with its colorful design, easy grips and great sound, it really doesn’t need anything extra. These colorful drums are a brilliant present for any baby over six months. With four songs to play along to and light up drum pads, your kid will be in awe of these great instruments and will have a great time drumming away. We also really love that these drums can be sets to be stationary or rolling, so once your baby is crawling around, they can push their drums along with them, they are great for play and encouraging crawling. These awesome bongos are a wonderful toy for a baby as they combine drums and rattle into one great package. 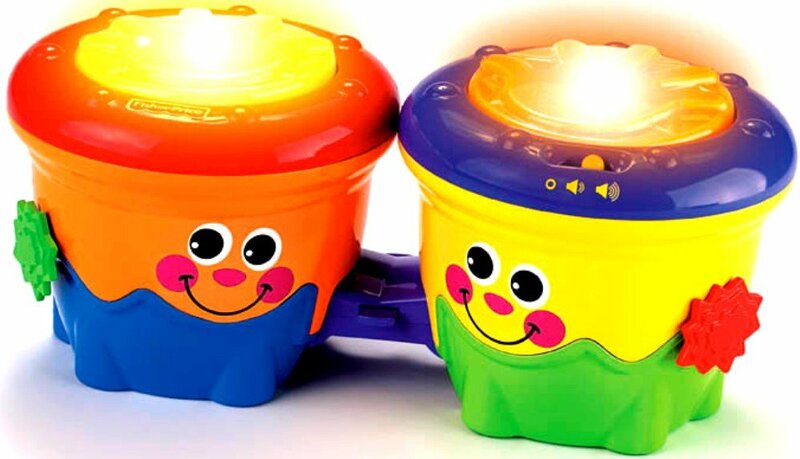 This is designed to be small and easy enough for the little hands of your young one to handle, and they can shake, rattle and roll all at once with this cool toy drum. 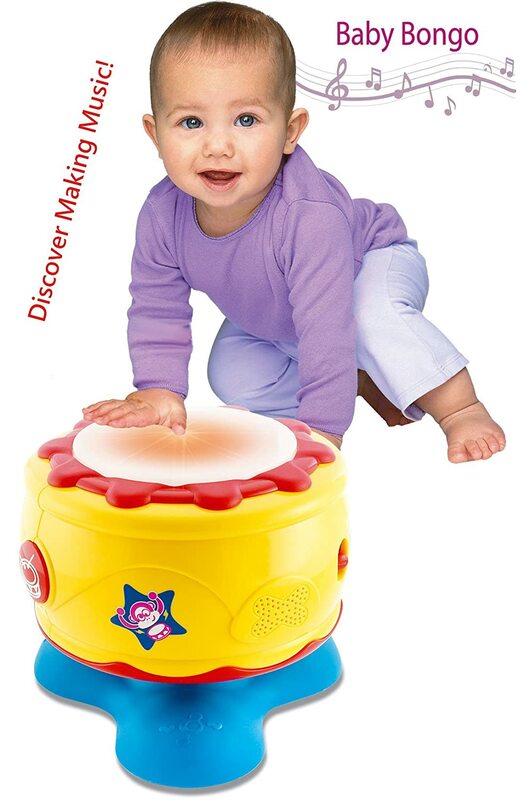 Turn bath time into a fun drumming lesson with this cool toy drum from Fisher Price! 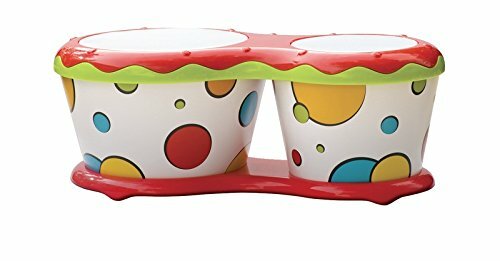 These crazy floating bongos bring all kinds of cool flashing lights and cute sounds into bath time, and little ones just love splashing about and hitting the pads as they bathe. While many drums set for toddlers use cheap plastics and other synthetic materials and have a really cheap sound, these cool bongos are made from real wood and have pre-tuned drum heads, so they sound very authentic. So your little one will feel like a real musician as they band away at these. Introduce your toddlers to the sounds of the rain forests with these cool Remo bongo sets. 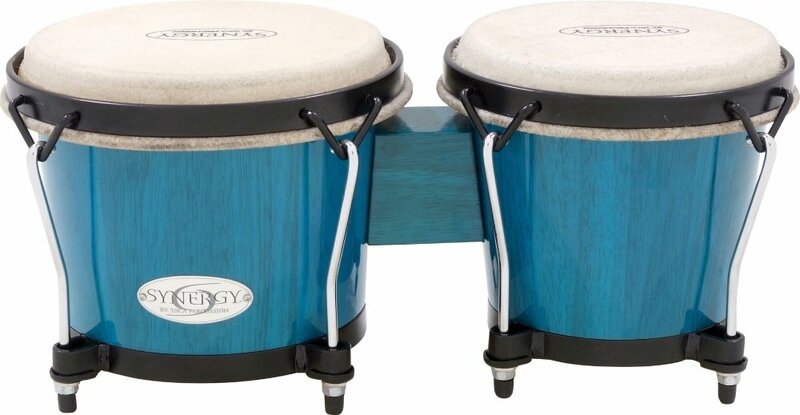 Designed by the great percussion company famous drummer Remo Belli, these kids bongos have Acousticon shells and Skyndeep pre-tuned drumheads, so they sound brilliant when those little hands connect with them. 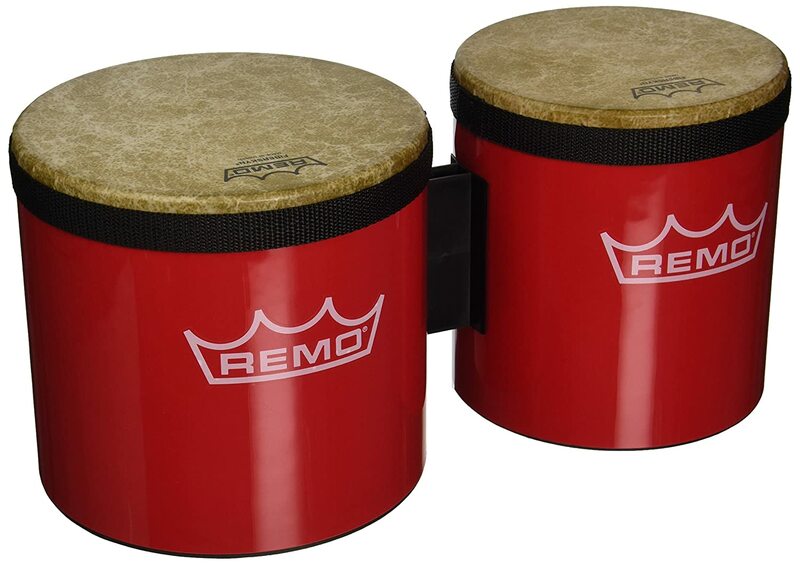 Some Remo Kids Bongos will be a great way to introduce your toddler to drumming, and who knows, they could spark a lifelong interest in Latin music. If your kids are anything like mine, you might have a hard time buying them anything everything they want has to be their favorite color. Well, these cool kids bongos come in red, blue, green, black and purple, so even my super picky children could find one they want. These also come in 4 inch and 4.5 inch sizes, so they are brilliant for toddlers and small children. They are very easy to play and good for students to learn on. The only drawback is that the drum shells are made of plastic, so you are not going to get as good a sounds as on wooden bongos. Still, they are very affordable and make a great budget set. Another great set of colorful drums to get your little one banging away to some Latin beats. What is really great about these kids bongos is that the synthetic drum head doesn’t fluctuate in pitch with temperature and humidity changes, so you won’t have to worry about getting it re-tuned very often if ever. 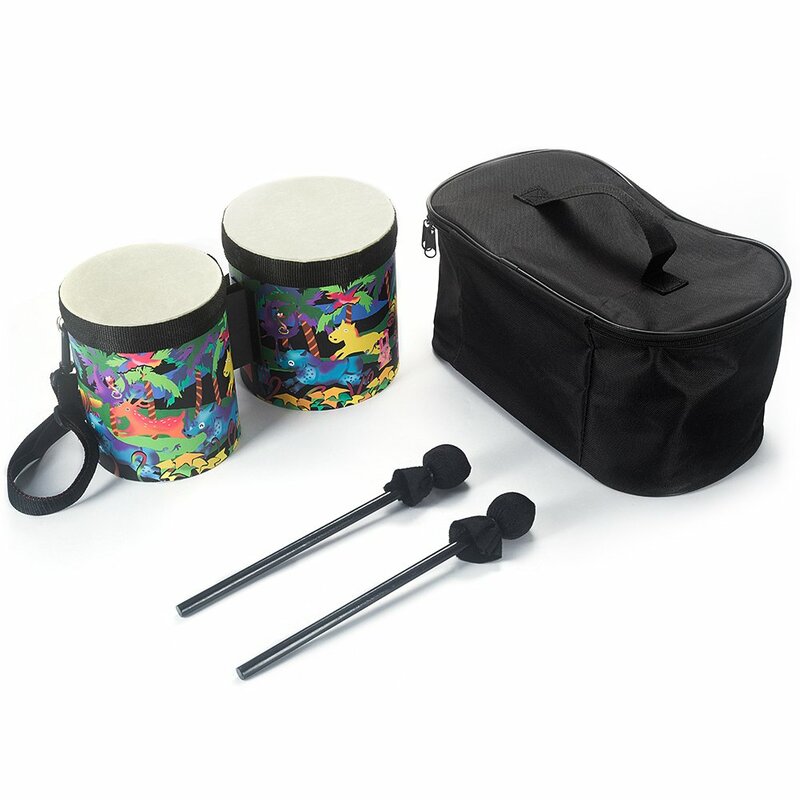 This comes complete with a carry case, and adjustable bongo strap, an a set of drum mallets, so this really is one of best bongos for kids we’ve found in terms of value for money. This beautiful set is currently an Amazon bestseller, and we can definitely see why. 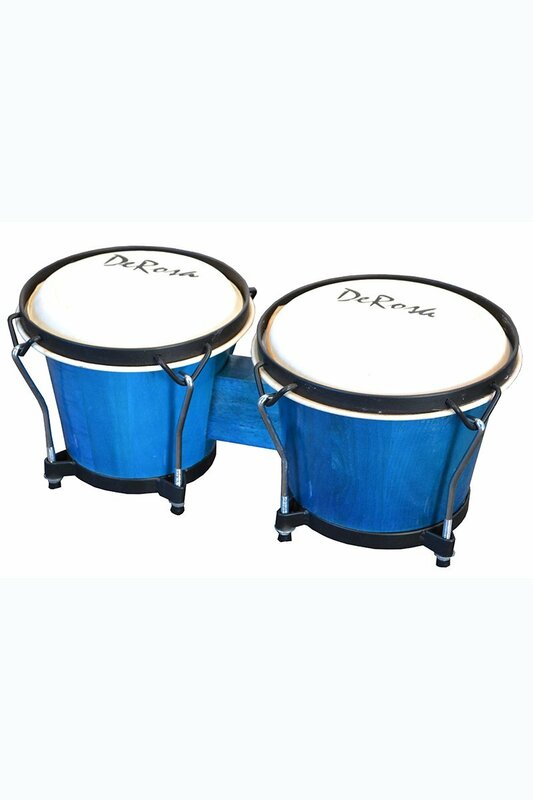 These high quality drums are 6 inches and 7 inches, making them a good size for older kids and teens, and they are made of high quality sturdy wood, metal and ethically sourced, smooth skins, so they not only look amazing, they sound great too. We know how much safety concerns parents and this drum bongo set has no sharp edges and all its rims are rounded. It’s therefore very safe for kids and beginners to carry around and use.! Begin your child beat journey with this rocking set of drums. 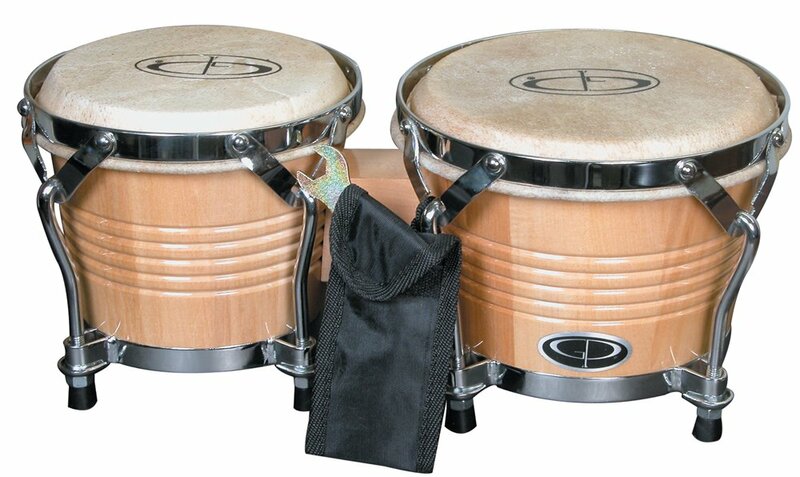 With a High Gloss finish, these wooden bongos will make a great choice for a child or beginner drummer. Made of natural wood and cow skin drum heads, these babies really do sound amazing and have a warm and rich sound you can’t get with plastic. 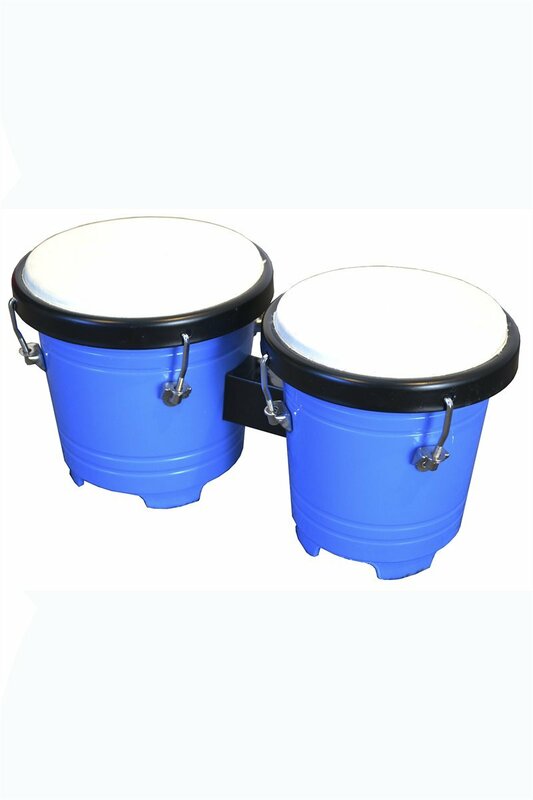 These bongos are a little bigger, with 7 and 8 inch drums, so they might be a little on the large size for younger kids, but older children and teens will be right at home with them. They also come with a great carry case and a tuning key! These cool wooden drums for kids certainly look the business, and they sound amazing as well. This 6 and 7 inch bongo set is made of a Hickory shell and has natural hide drum heads. It also comes with 4 tuneable lugs and a handy tuning wrench. It also has rubber stoppers on the bottom to stop to damaging tables or surfaces. 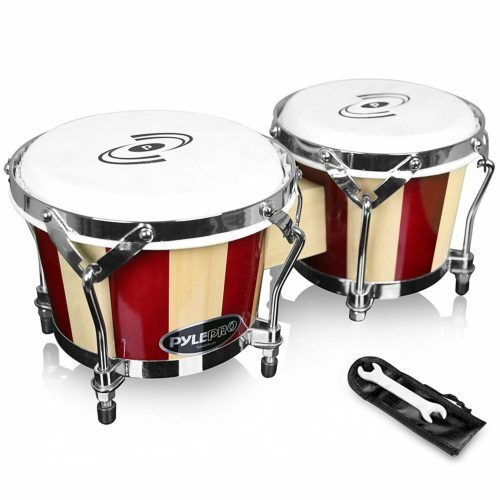 Another great set from Remo, these come in a choice of three different colors, black, red and white, so they are great for kids with a strong preference for one of these colors. They are constructed with pre-tuned skyndeep drumheads and acoustic shell, which accurately reproduce the sounds made by traditional Cuban wooden bongos and have some really great high pitched tones. This stylish Remo drum set will make a wonderful gift for a 10 year old who wants to take up hand drums. With mural rawhide heads and plywood shells, these great kids bongo sound incredible. They also come in a range of different colors, and the high quality finish on the materials looks wonderful. These drums are also made in a from sustainable forests projects in Thailand, and handcrafted by local craftsmen, so this is a great ecologically friendly present to get your child. These gorgeous drums are not cheap, but if you buy them, you can be confident that you are getting a top quality instrument with brilliant design and finish and, more importantly, one that sounds great. 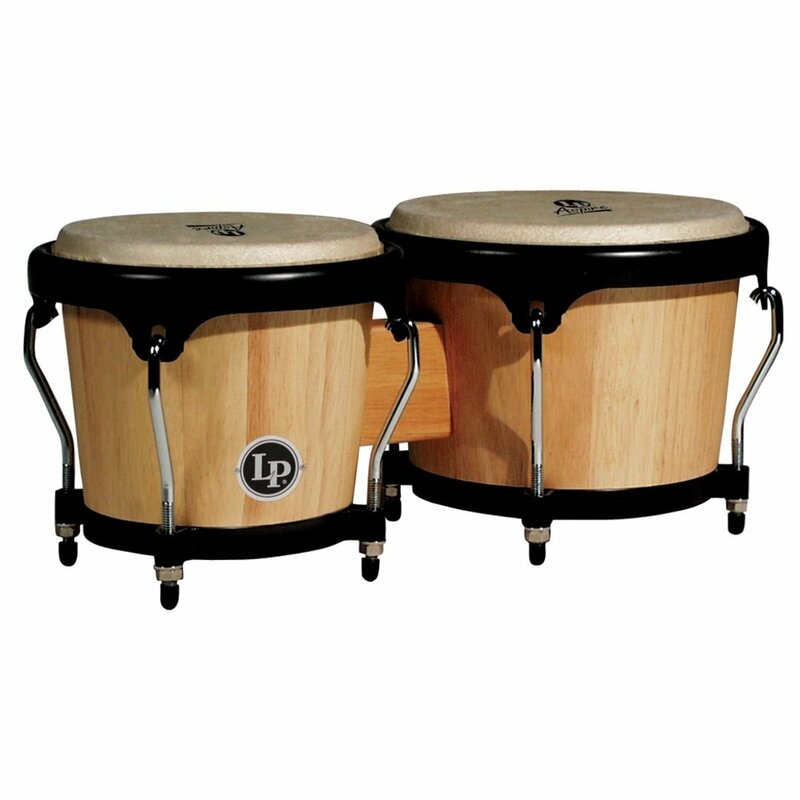 LP Apsire makes some of the best hand drums in the world, and these LP bongos are some of the best we’ve come across while still being affordable. These are made with Siam oak shells and black powder coated hardware, so they sound absolutely incredible. The build quality is very sturdy and strong, and they also have LP Aspire EZ Curve Rims. What is also cool about this one is that they have a matching set of conga drums, in case you want to buy your kid a whole set. 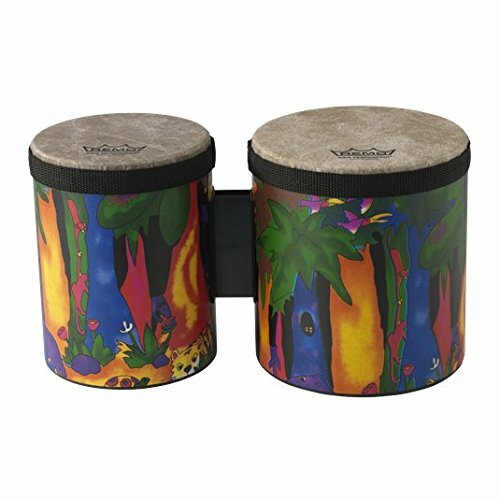 These are definitely not cheap bongos, but they are very high quality, and as such, we only recommend them for kids or teens who are serious about drumming. With real buckskin heads, and black powder coated rims, these Derosa Bongs sound absolutely amazing, and they make a great choice for beginners of any age who are looking for a rich and full sound at an affordable price! They are crafted out of solid wood, so they are both durable and have great tone. 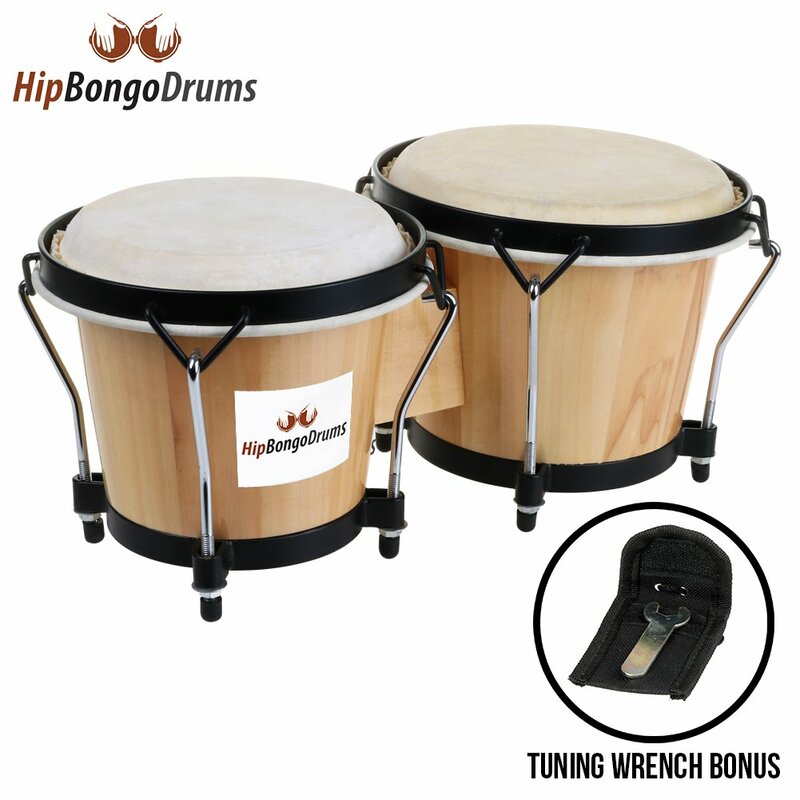 These cool bongos come in a range of different colors and even come with a tuning wrench. These are some of the best cheap bongos we’ve come across, and your kid will really love playing them. Spice up your child’s musical life with these amazing hand crafted wooden bongos. With natural animal hide skins and chrome plated hardware, these amazing bongo drums feel fantastic in your hands and sound even better when you play them thanks to their crystal clear acoustical percussion sounds and wonderful, natural tones. These are perfect for kids or tens, as they have smooth, rounded edges and will be very comfortable for youngsters to hold. They are also very durable, so you don’t have to worry about your kids breaking them. These will make an excellent birthday or Christmas present for a kid who loves drumming! If you really want to get your little one the best yet still affordable bongo drum set, the Aspire Bongos are going to be your best bet. These drums have very high quality materials, and the construction quality and fittings are of a really high standard. This means that they look great and sound even better. With proper care and treatment, these cool drums will last for many long years to come and will keep sounding good all the way as long as your kid looks after them. That’s why we recommend them as our top pick for bongos. Maybe you are on a bit of a budget, or maybe you don’t want to splash out on something that your kid might not really be that interested in? In that case, we recommend the Kids Bongo Set. These colorful drums still sound pretty good, and coming with the free carry case and mallets, your getting very good value for money. So your little drummer has just got their first cool set of child size bongos, but what if you can’t find a good teacher? Well, don’t worry, here’s a few good ways to get your kid started on their drumming journey. 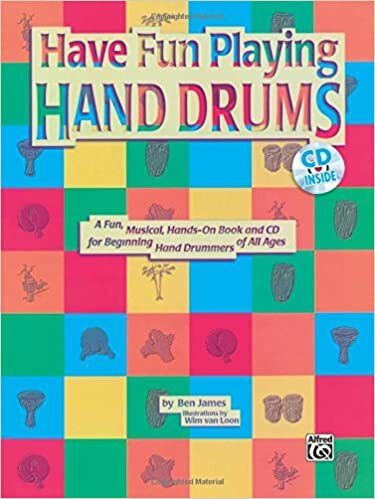 The book has very instructional and beginner friendly illustrations and the CD has audio versions of the lessons and play along with drum tracks. 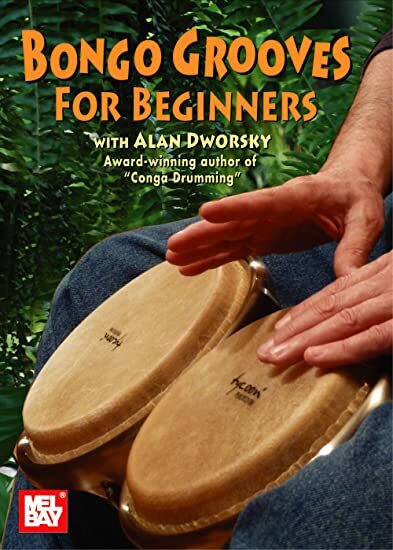 Your children can learn to play their bongos with these set by step lessons from a great bongo drummer. Designed for the first-time hand drummer, this cool DVD teaches 21 fun grooves that are perfect for kids who are getting the hang of the drums or playing them for the first time. 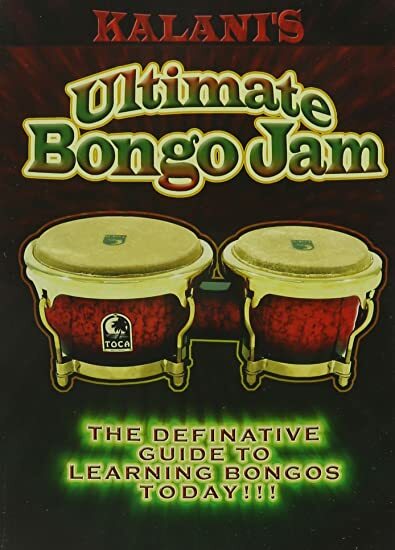 Using a wide variety of music such as Funk , Samba, Pop, Calypso, and more, this cool DVD focus on learning the techniques and skills needed to be a great Bongo player. It was developed by a drummer with over 25 years of experience in playing the instrument and will be brilliant for an older child or teen. This one is a little more advanced and would be better for an older kid who is a little familiar with the drums. Where to buy bongo drums? We see no problem in buying bongo drums online from a reputable store, as long as you get a good brand and make sure it is the size you want. And remember, you can always send it back if it is not what your kid wanted. Also, if you do go to a music store and your child finds a set of bongos they really like, you might be able to find them cheaper online. How old to start playing the bongos? What we really love about bongos and hand drums is that as soon as your child is old enough to hit the skins, they can start playing! There’s no need for any kind of instruction or lessons for babies and toddlers – just let them have a blast while making a racket. Once your kids are a little bit older and coordinated, it might be time for them to get some instruction with their bongos. You can try to find a good music teacher, or you can find them some cool lessons online. There are some brilliant bongo tutorials for free on Youtube. The great thing about playing the drums is that your children are almost never too old to learn. Any age can get into it if they practice enough, regardless of whether they are young kids, teens, or adults. What are bongos made out of? Bongos are and Afro-Cuban drums set consisting of two drums joined together, a larger and a smaller one. The bodies of the drums are usually made of wood but they can be made of plastic, fiberglass or metal too. The tops of the drums, called the drum head, were traditionally made of animal skin, but some modern drums, such as Remo bongos, have drum heads made of synthetic materials. Once the drum shells have been made, and everything is measured perfectly, they will then begin to fully form the drum by shaping it with precision cutting tools. Once this is finished, the drums are sanded and painted. Its now time to stick the drum head on. These are usually soaked first, stretched over the drum, and left to dry while held in place by a metal wire. This ensures that, as it drys, it will perfectly fit over the drum. Once dry, the head is usually fastened or bolted in place, and any extra skin is cut off. Like any other instrument, bongos will eventually go out of tune, and they will need to be tuned. But don’t worry, it’s not rocket science, and even a complete beginner can learn how to tune to bongos. Are there different types of bongos? While many people often think all hand drums, such as Congas and Djembe, are types of bongos, there’s only one type of bongo drum, and the main difference is going to be which materials are used in its construction. Natural wooden bongs are usually going to sounds the best, although fiberglass drums can also sound good if well made. Plastic bongos ten to sound a bit thinner, but they are usually cheaper and great for those on a budget.